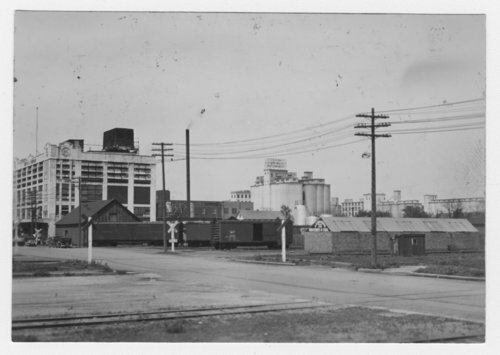 This black and white photograph shows several mills and grain elevators in Salina, Kansas. In the background one of the mills has signage that reads "American Eagle Flour." The photo was taken on E Elm St, looking NW between N 5th & N 3rd St. The tall industrial building on the left is the Swift & Co. building, built in 1926 by the Eberhardt Construction Company.